When I saw this mirror frame Jaime from That’s My Letter made, I was instantly head over heels in love with the branch circles. So much so, that every branch I passed by I would think, “Hmmm, I wonder what the disks on that branch would look like. It’s a sickness y’all. So, this past weekend, I hauled in a bunch of branches and began to formulate a design for my Valentine’s Day Wreath that wasn’t overtly cutesy. I am thrilled with the final results. Although I had to engage in a few extra spray painting steps to get here, I’ll spare you the details. Let’s just say that no matter what color you paint thin wire, it just doesn’t show up on top of wood disks. Here is the tutorial y’all. Take it or leave it, but just be sure you ask before cutting down your neighbor’s cherry tree. Start by setting up a stop block by clamping a small piece of wood against the fence of your miter saw. (Or be prepared to be diligent about measuring every slice you cut. My slices are 1.5″ wide.) IMPORTANT: Wear your eye protection and hearing protection! Hold your branch against the fence and cut into the log. The larger logs cut fine, but the smaller branches and sticks tended to kick back all over the place, so be sure you stay on the right side of the saw and the slices are on the left. This way you’ll be out of the path of the flying disks. Cut, until you have a large collection of wood slices in a variety of sizes. It was at this point that I looked down and noticed this little worm squeezing out of the log! Ewwww. I rushed inside to research killing bugs in wood. I read you can either bake your wood in the oven at 175˚F – 200˚F for a few hours. Or microwave the wood for a minute. Being the perfectionist and neurotic termite-fearing person I am, I did both! After roastin’ and nukin’ those little buggers, you can lay out the slices onto the plywood in a heart shape. Trace roughly around the shape. As I said I’m a perfectionist, so feel free to skip this next step. Fold a piece of scrap paper in half and cut out a half heart shape to give you a symmetrical heart shape. Trace around the template onto the plywood. 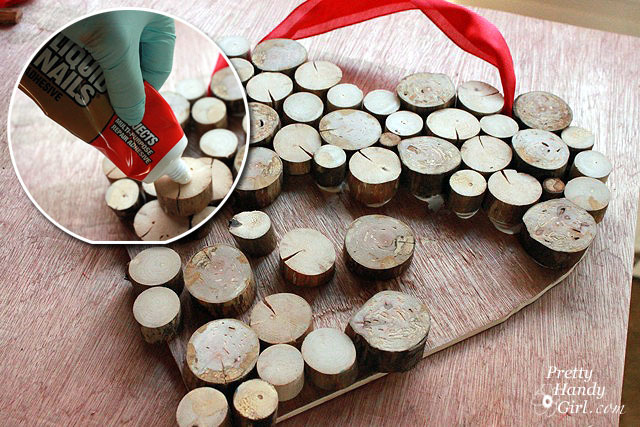 Use a jigsaw or Dremel TRIO to cut out around the shape. Sand the edges until they are no longer jagged. Lay the scrap paper template back on top of the heart shaped plywood. Fold it in half. Drill a hole through the top of one of the sides of the heart (through paper and wood.) Open the template back up and mark where the hole is in the paper. Drill through the other side. Thread a length of ribbon through one hole. Tie a washer onto the end of the ribbon on the back side. Hang the heart up in your desired location. Adjust the length of the ribbon and then tie another washer onto the ribbon. Begin to lay the wood slices back onto the plywood and start gluing each one using Liquid Nails. It may take a little maneuvering and trials to get the slices to fit neatly within the heart shape. But, hey it wouldn’t be fun without a little trial and error. After your shape is filled, lay a folded towel, some scrap wood and heavy weights on top. Do a few bicep curls before setting them down, just because. While your wooden heart is drying, bend the word “Love” into the wire using needle-nosed pliers. Wrap white pipe cleaners around the word. Then wrap red pipe cleaners around leaving space so the white pipe cleaner shows through. Tie a bow at the top of the hanger ribbon. Thread another length of ribbon through the bow and secure it to the “L” and “e” in Love. Find a spot to hang your unique wreath. I wonder if I can put another word on there for St. Patrick’s Day? Maybe “Luck” with some green ribbon. Awesome work! What type of mider saw blade did you use to cut this thin branches? I had someone recently change my blade and now I have been having kick back and actually got cut from s flying piece of wood. I never had this trouble before so I am thinking it is the type of blade.